These make a great lazy brunch, serve still warm with soft butter during a party or feeding a crowd. 1. 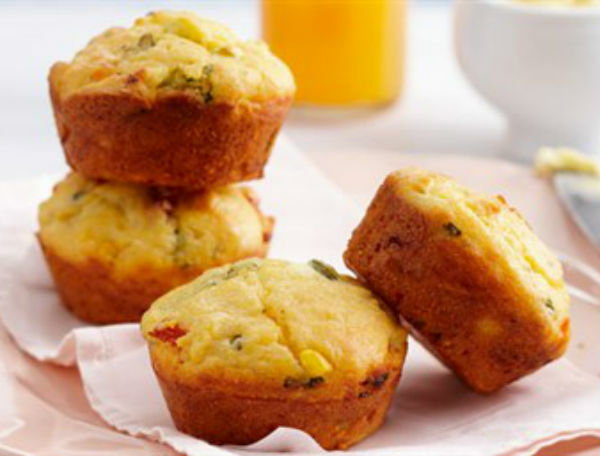 Heat the oven to 200C/fan 180C/gas 6 and brush a 12-hole muffin tin with melted butter. 2. Put the sweetcorn in a pan with the finely chopped onion, chopped red chilli and a knob of butter. 3. Gently fry for 10 minutes until golden and soft. 4. Mix plain flour, polenta, baking powder and grated strong cheddar with 1 tsp salt in a large bowl. 5. Whisk the eggs, buttermilk and milk then stir into the dry ingredients with the melted butter and the corn mixture. 6. Divide between the muffin holes and bake for 25-30 minutes or until golden brown.